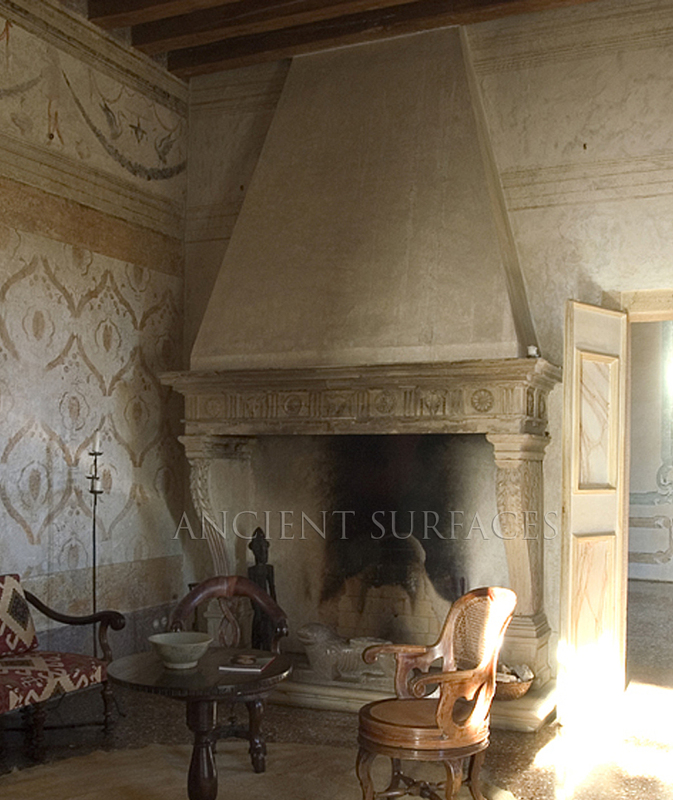 italian villas | Antique Fireplaces by Ancient Surfaces. 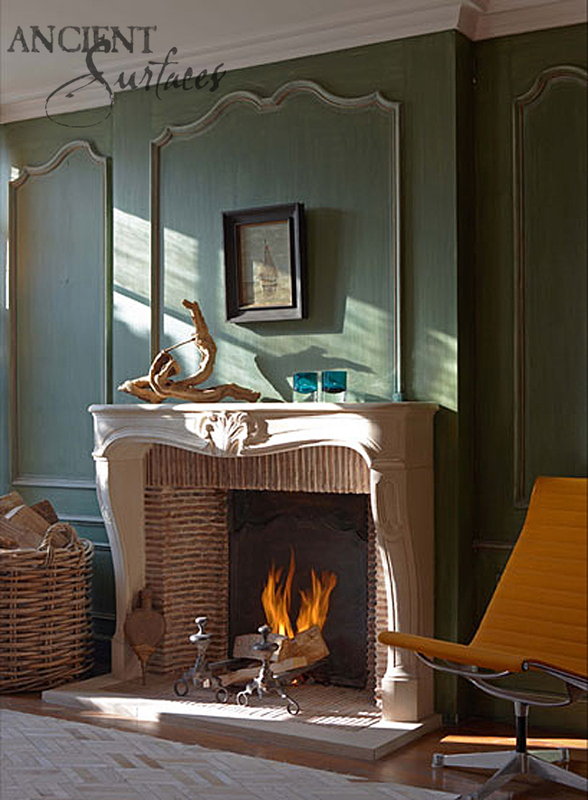 A fireplace is often a focal point already, but when holidays come, it takes on added significance —with Santa coming down the chimney and all. 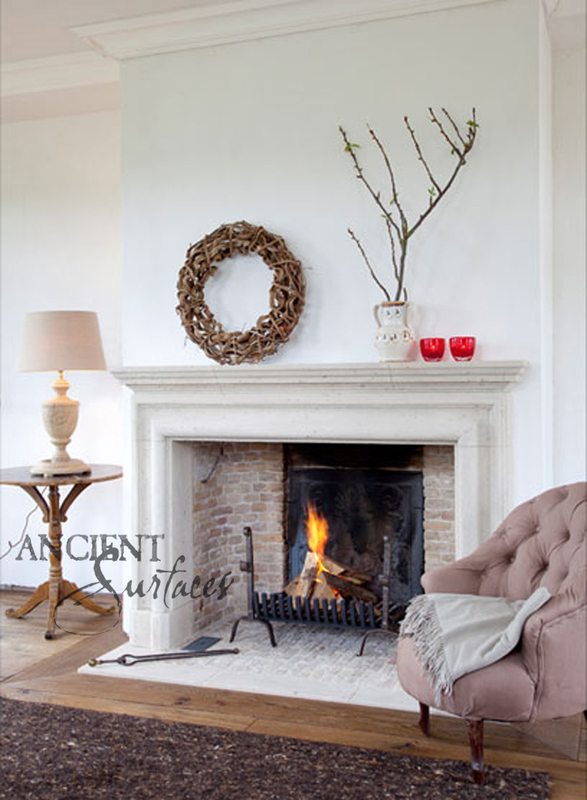 Encircle your Christmas stockings with mantel decorations to suit the holiday spirit. 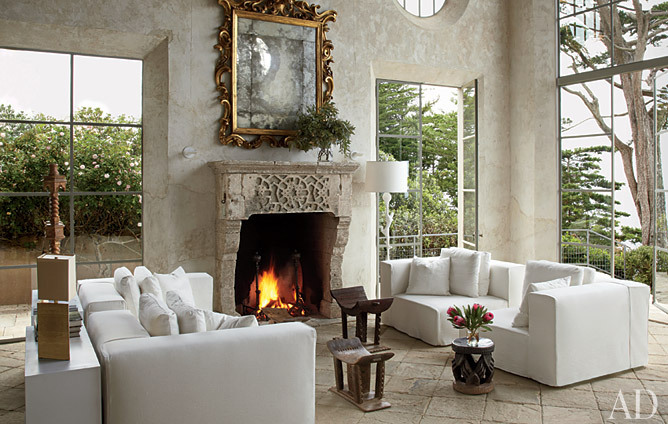 Once your fireplace is cheerful, it’s time to light a fire, sit back with a glass of wine and soak up that heart-warming feeling of the holidays at home. 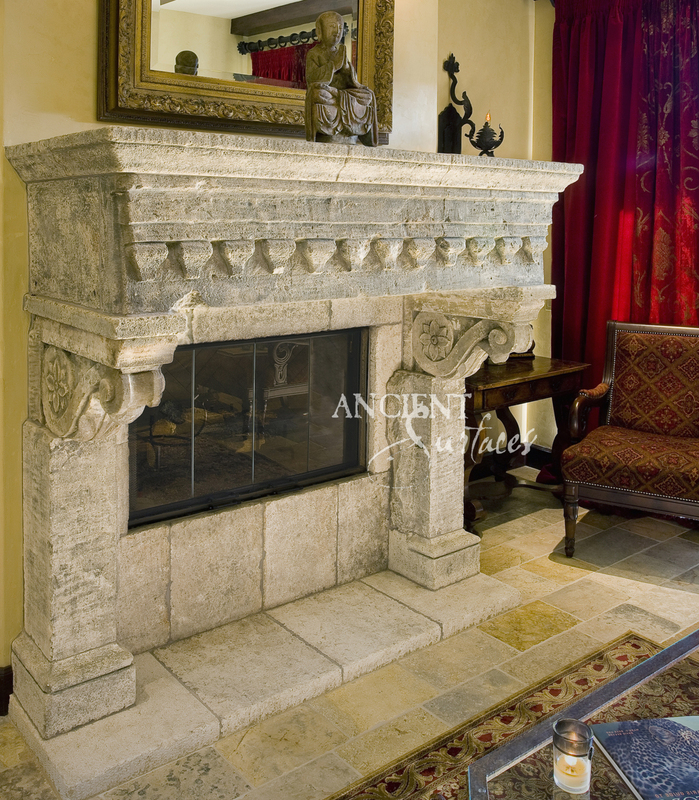 A fireplace is always on display, but this time of year it’s especially under the spot lights, with friends and family warming up in front of a roaring fire or huddling in the living room for an evening of games or movies. 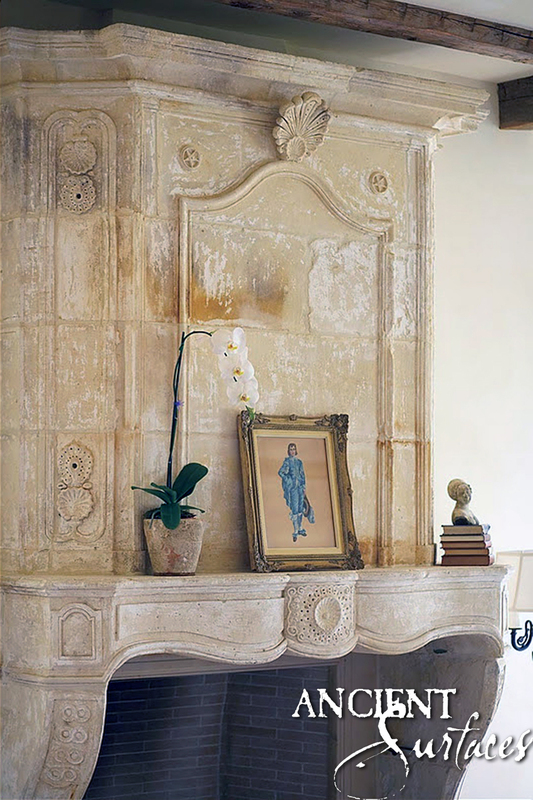 The stone mantel, which usually is an added value actor throughout the year, lands a starring role around the holidays, with beautiful, stockings and string lights draped across it. 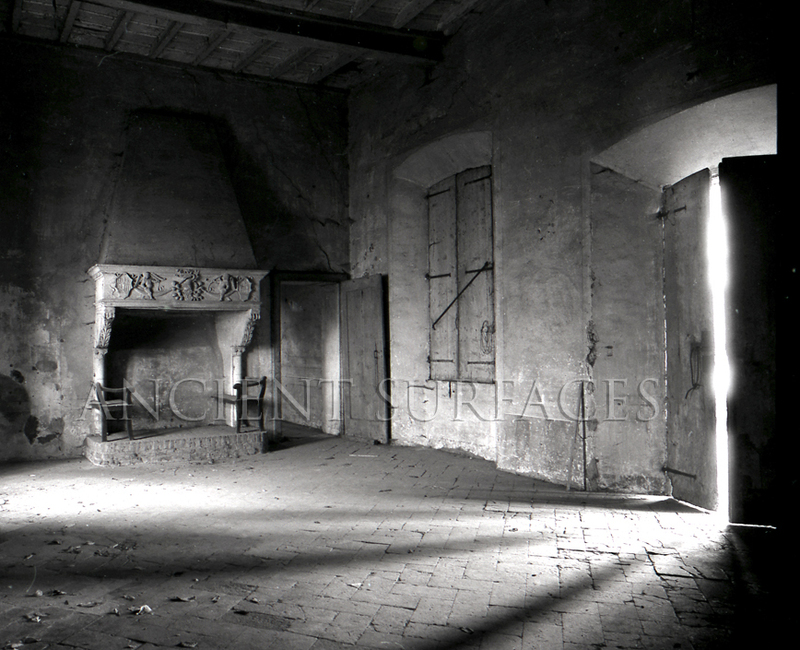 A mostly white color palette with pottery, tea lights and snowflakes contrasts dark foliage and garlands. Looks beautifully matched with the Christmas tree. Gives feeling of warmth. 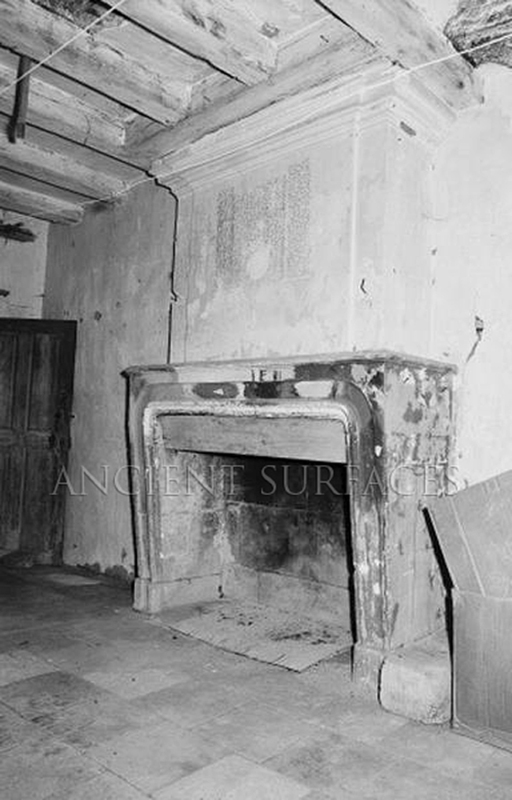 The stone fireplace shown in here follows a Romanesque Revival or, more specifically, Romanesque style. 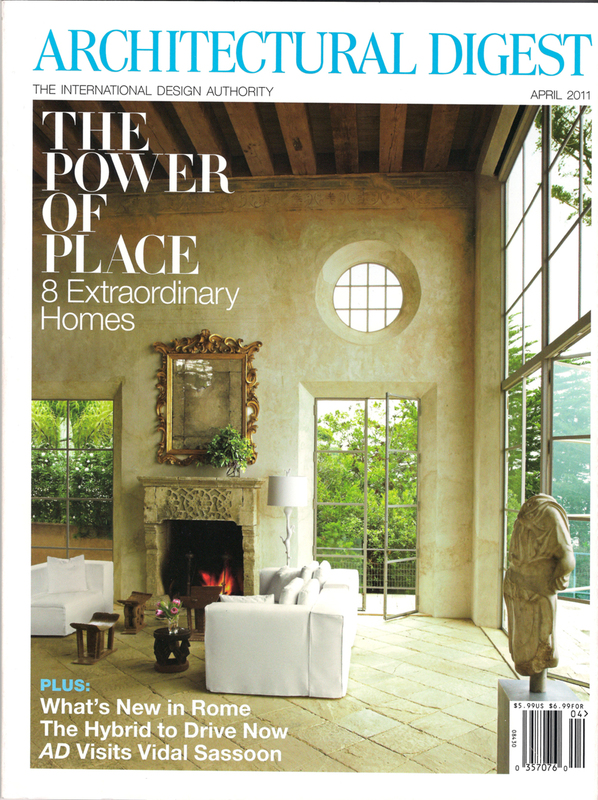 Located in the home’s formal living room, it has a very robust and masculine look. 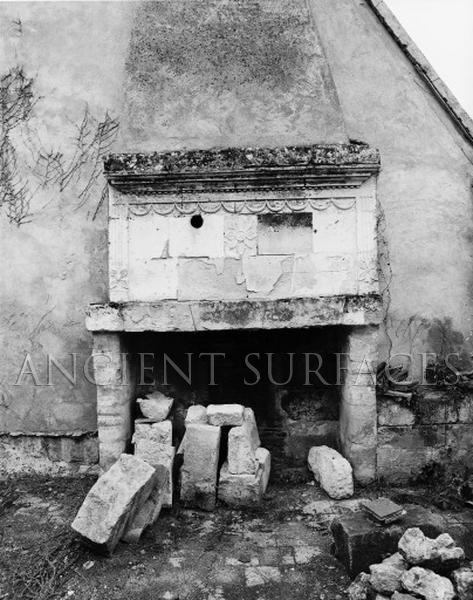 A French Provence Antique Limestone Fireplace adorned by Garlands, flanked by stockings and decorated with Mistletoe, Red Roses and Christmas shrubbery. 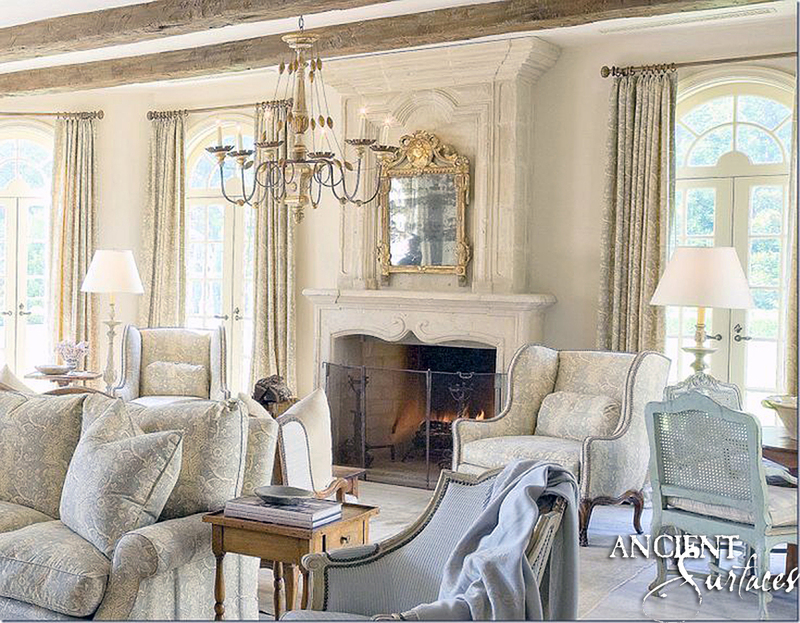 Natural greenery, wreaths, candles, silver, gold and white … white bee lights covers this beautifully cared mantel stone fireplace that sets a truly Christmas spirit for this room. 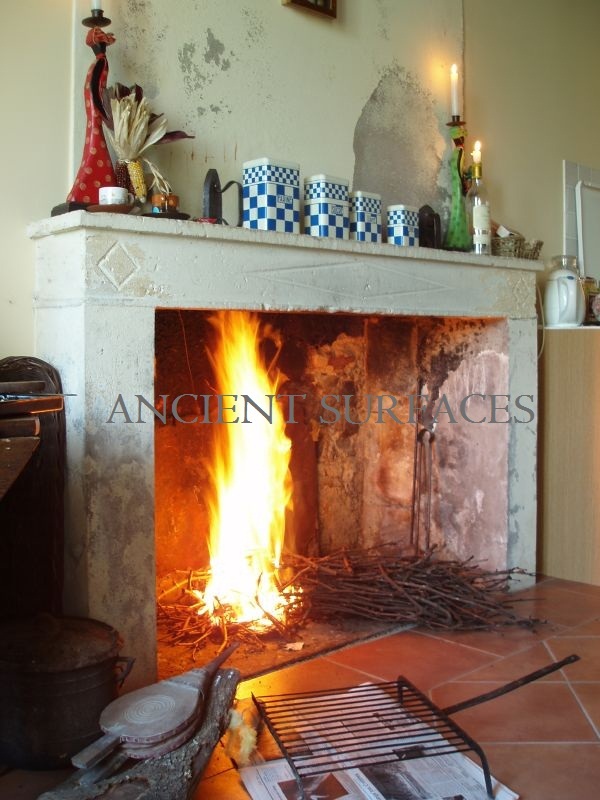 Very simple and clean fireplace, very warm yellow lights are dispersed around the fireplace and on the stove along with reindeer and a tiny Christmas tree to create a special mood and get into the Christmas holiday feeling. 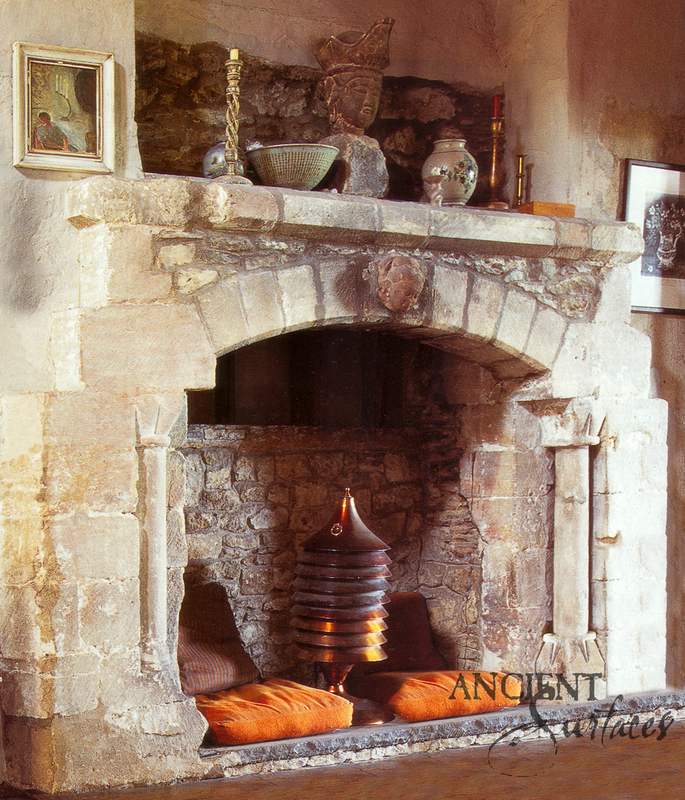 An Authentic French Pyrénée mountains Fireplace carved in the style known locally as the “Cheminee Montagnard Des Pyrénées” finished with a minimalist natural garlands, wine flasks, organic homemade Bees wax candles and an antique Candelabrum. Simple vs. Classical Beauties. 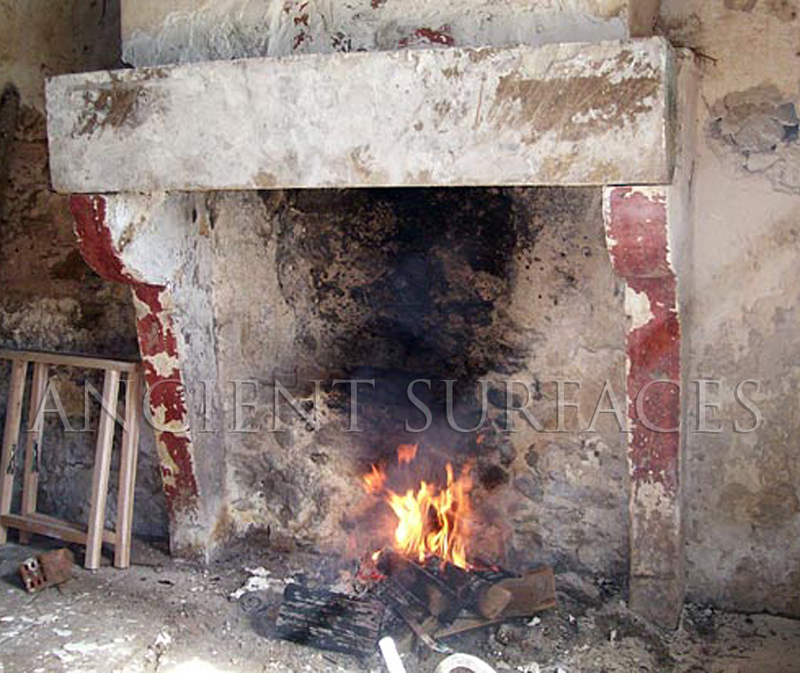 which fireplaces will you choose? 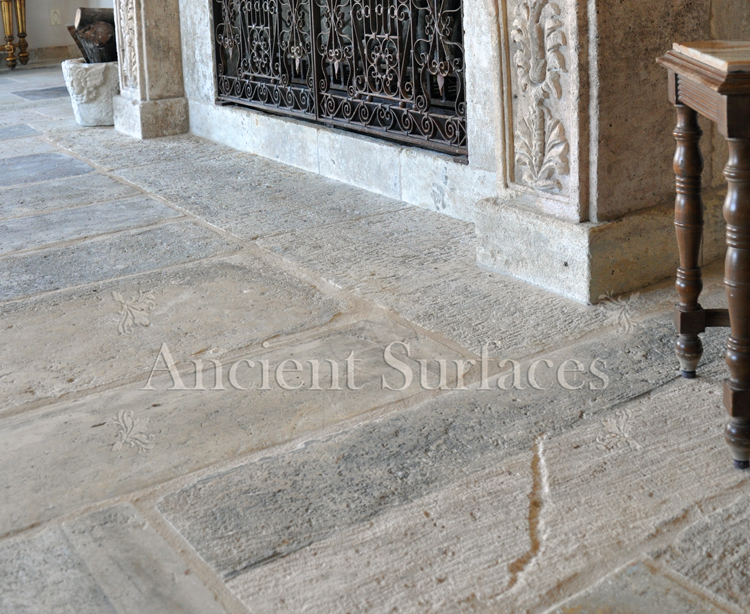 They say nothing lasts forever, but we all know that one can own a few items that may last for generations to come. No, we’re not talking about a girl’s best friend to quote Marline Monroe. Even though our stones can’t be worn on your wrists or fingers, they still can be a crowd pleaser none the less. 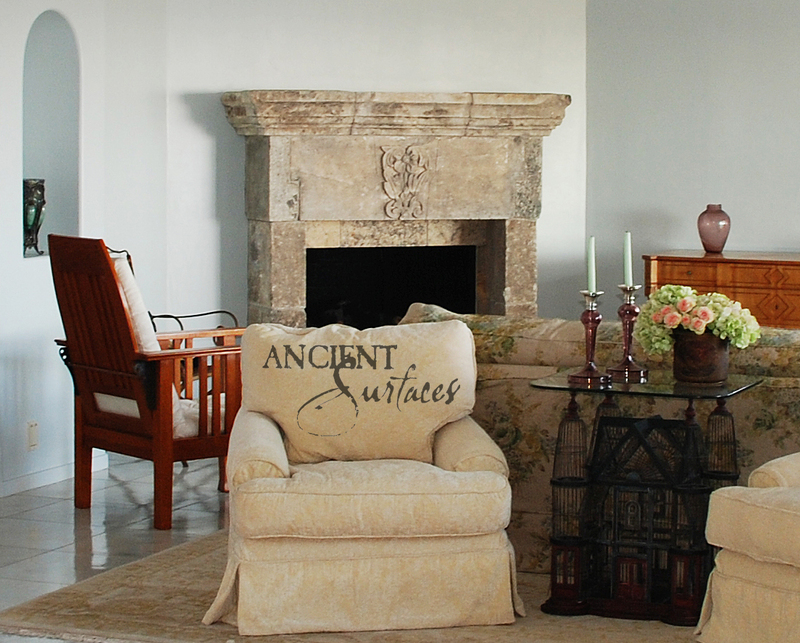 Installing an antique limestone fireplace in your family room can be the one design element that everyone in your family agrees with and is comforted by especially when it starts raining or snowing outside. 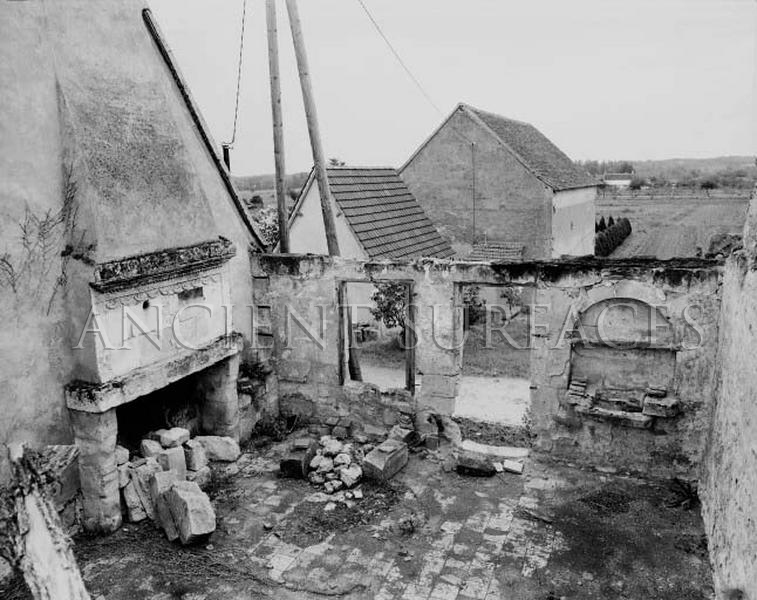 Pedigree (History and Provenance) of the fireplace aside, what design elements one should consider when selecting a fireplace that may last you a lifetime in some cases? 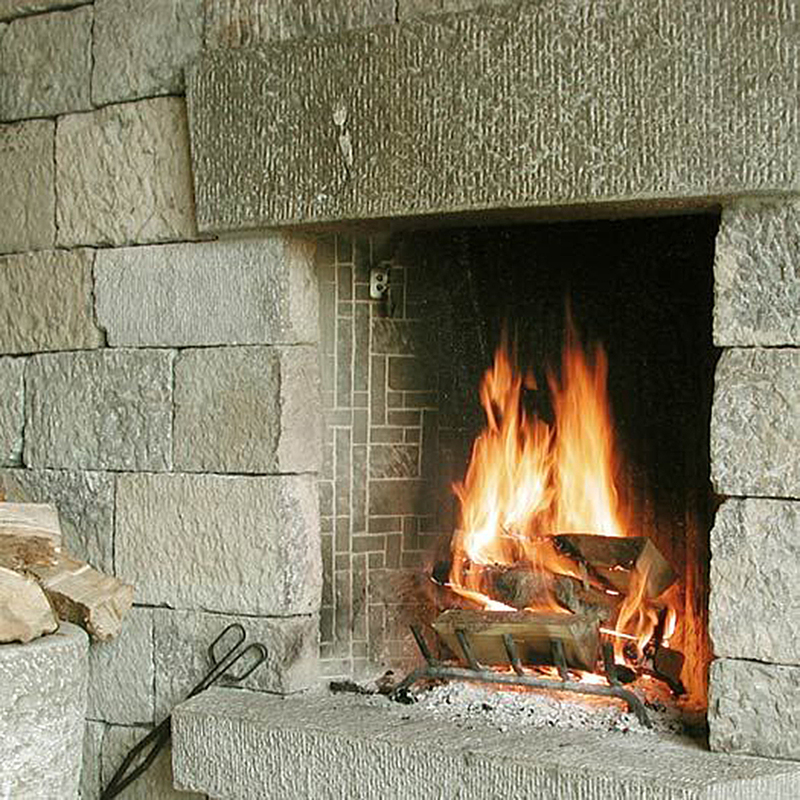 You always need to keep in mind that your fireplace selection will have to be a permanent fixture in your home and is supposed to live through any design change your room or home will be going through in the future. What would you rather go for? 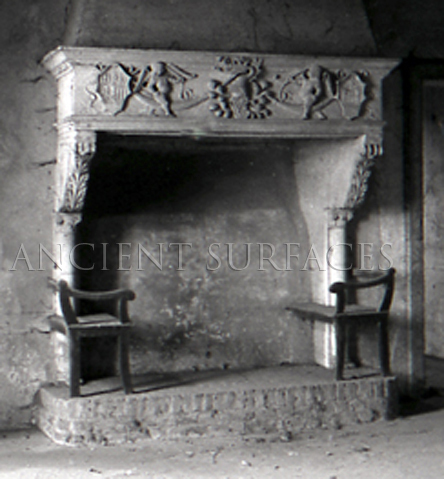 A well carved fireplace or a simply hand carved one? Let’s consider the positive aspects of both choices and see how they may pertain to your taste buds. 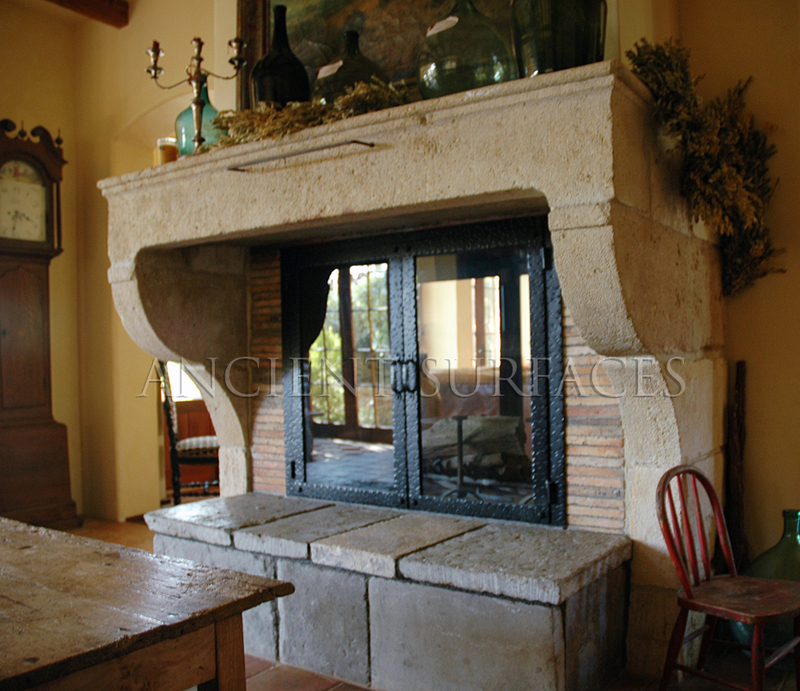 When considering a fully hand carved limestone fireplace close your eyes and think of a complex and rich multi-layered ‘Taurasi’ wine blend from ‘Campania’ that’s been well aged in oak barrels. 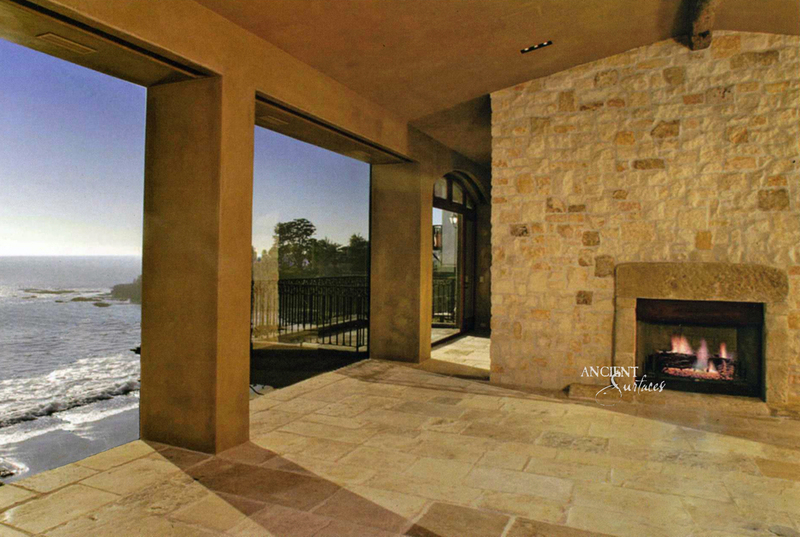 What nuances would your eyes savor? 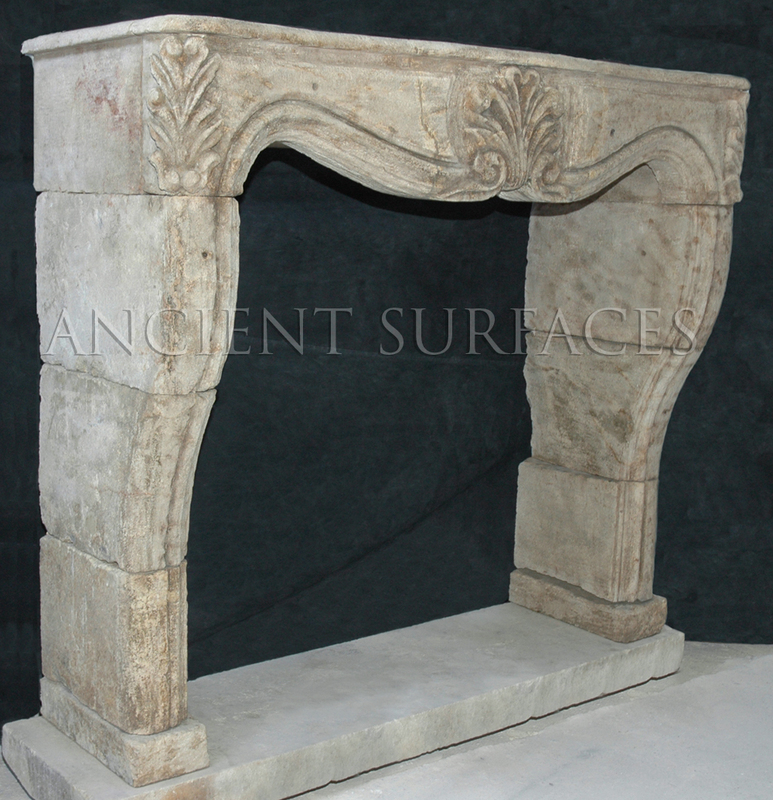 Can you envision tasting the Southern Italian Baroque acanthus leaves free flowing on this mantle corbeled sides or the rich and velvety pallet of the sprawling and spiraling vined foliage that can grace the front face of your unique fireplace? 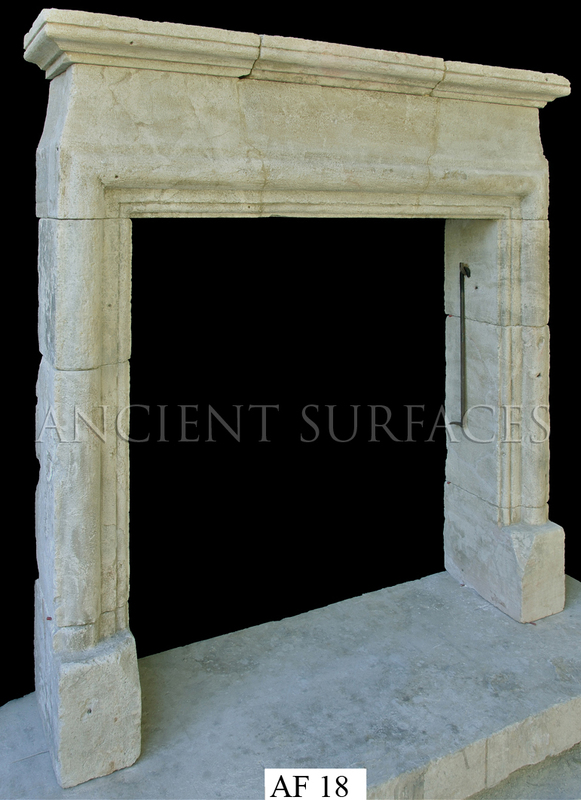 If you picture yourself in that frame, allow yourself to be captured by an antique well carved limestone fireplace that’s been salvaged from centuries old Renaissance or Baroque castles by Ancient Surfaces. 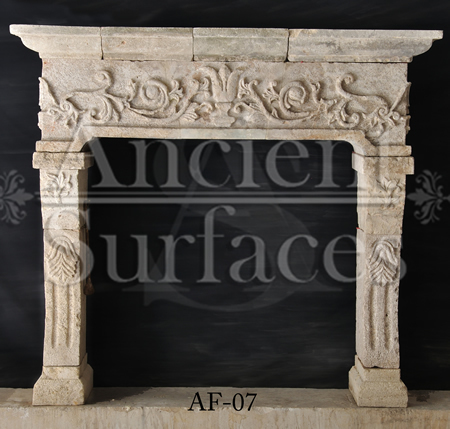 A fully carved fireplace of that era will define the look of your entire room and anchor your whole house with an authentic design persona. 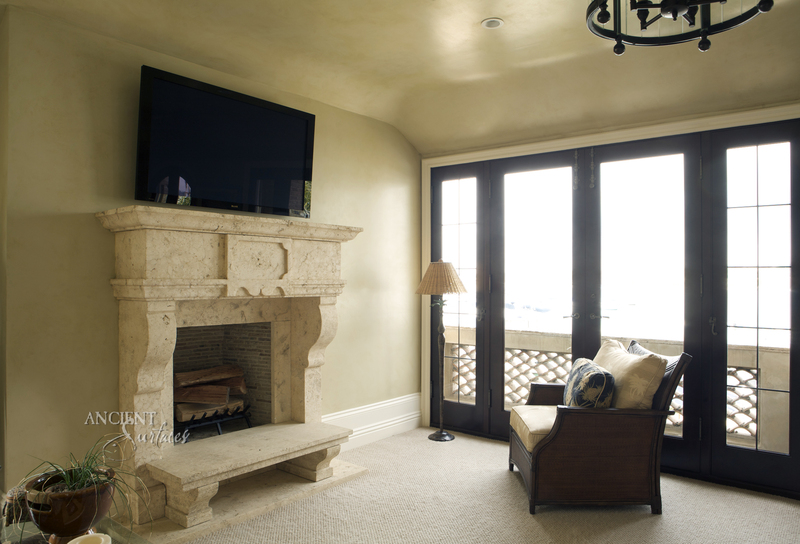 Simply carved fireplaces allow visual evenhandedness between styles, finish patina and shade of the room and the stone of the fireplace. 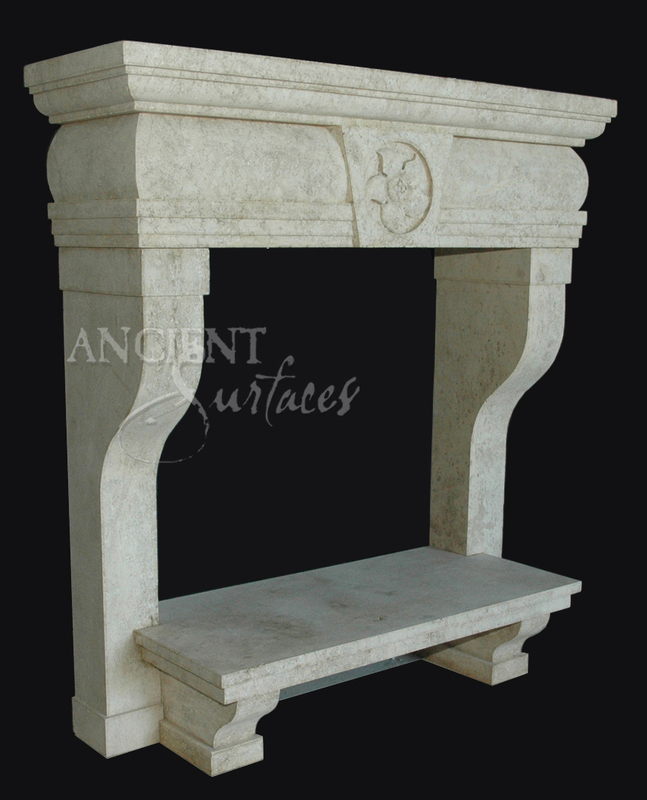 In a simple fireplace the design focus shifts from the carving to the actual antique limestone itself as it becomes the predominant design feature of the mantel instead of its minimal carved elements. When it’s simple it goes with everything else right? 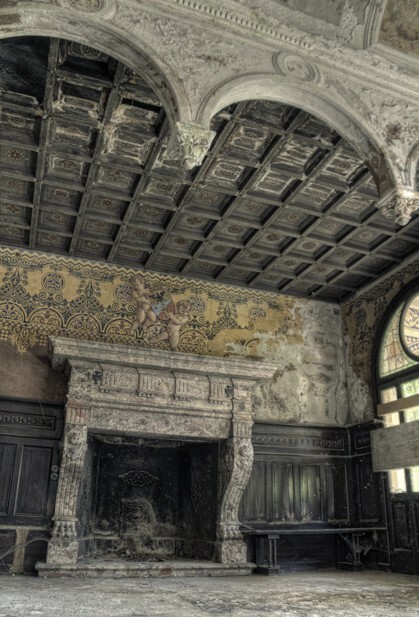 Well yes that is true, but one has to be careful that going with everything doesn’t turn into a disappearing act where the mantle itself totally blends with its environment in the same way a window frame blends with the wall. 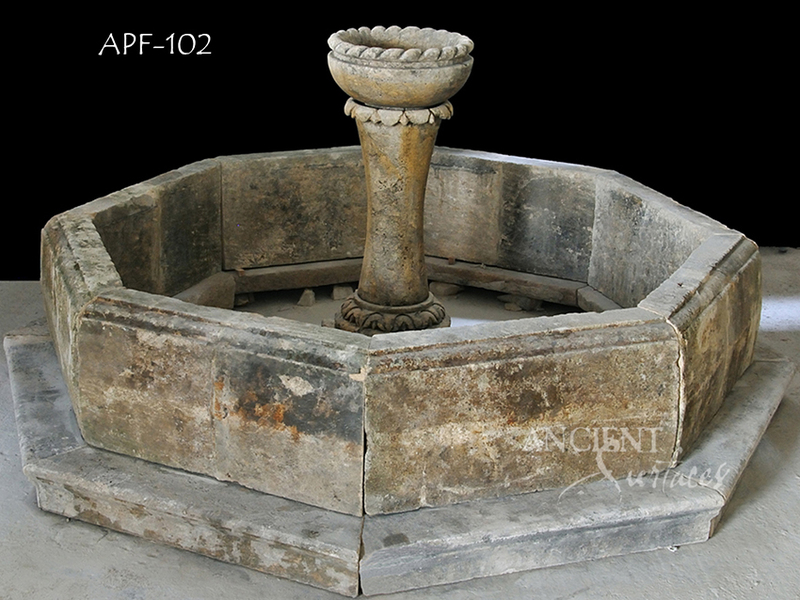 Simple architectural fireplaces when realized symmetrically and when created and carved under the golden ratio and the golden mean will carry more of a creative punch than most of its other ornately carved counterparts. 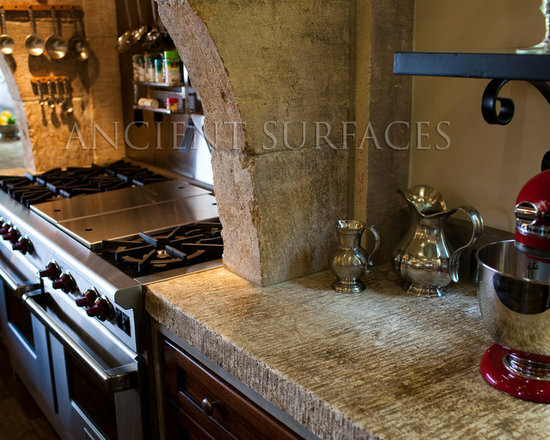 Minimalism when portrayed in well-defined and harmonic ratios, guarantees you a powerful visual output and a soothing organic feel that will satisfy your design vision for that space. 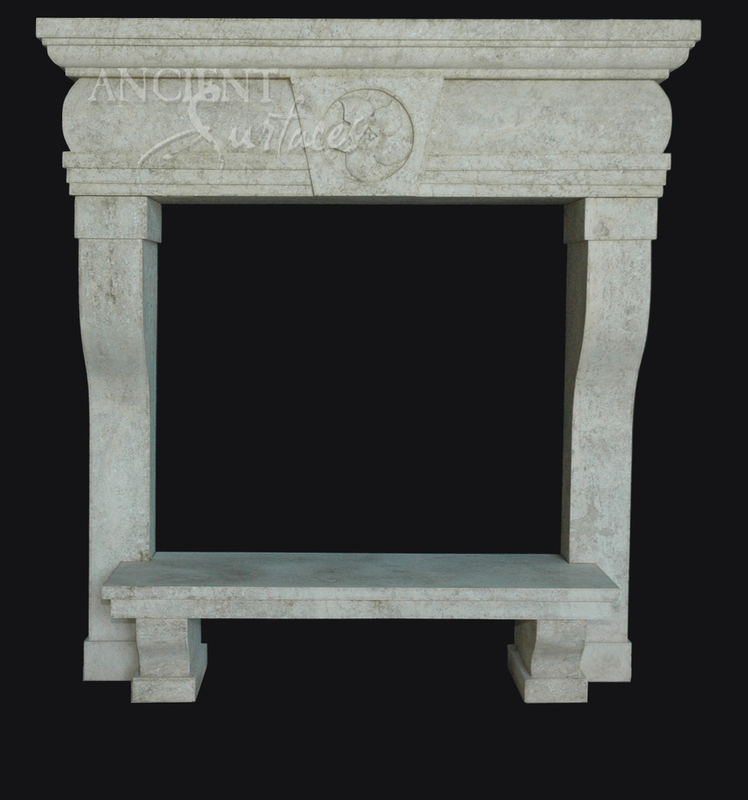 With a simple yet elegant antique hand carved fireplace you’ll be looking more at the architecture, structure and patina of the fireplace and how its various component simply integrate together with your space. 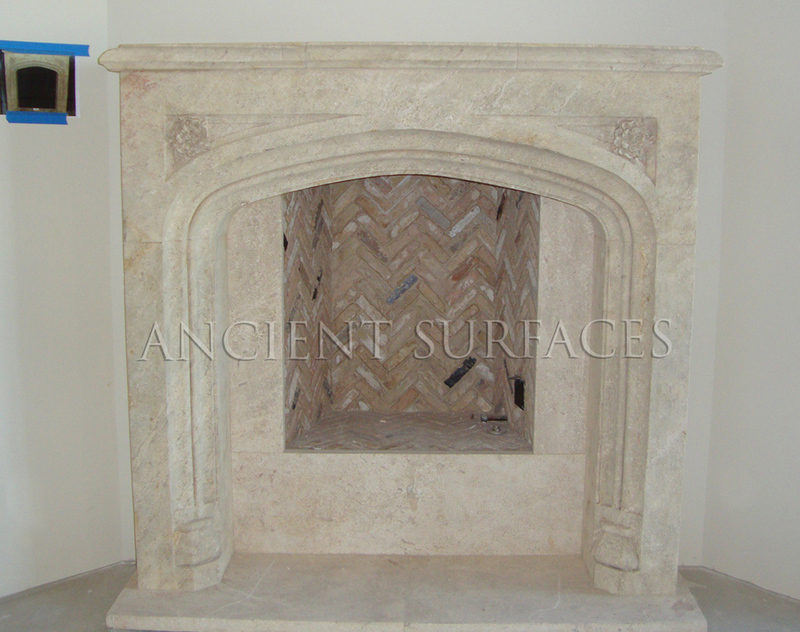 A simple fireplace hand carved in natural stone installed with herringbone brick inlay into the firebox. 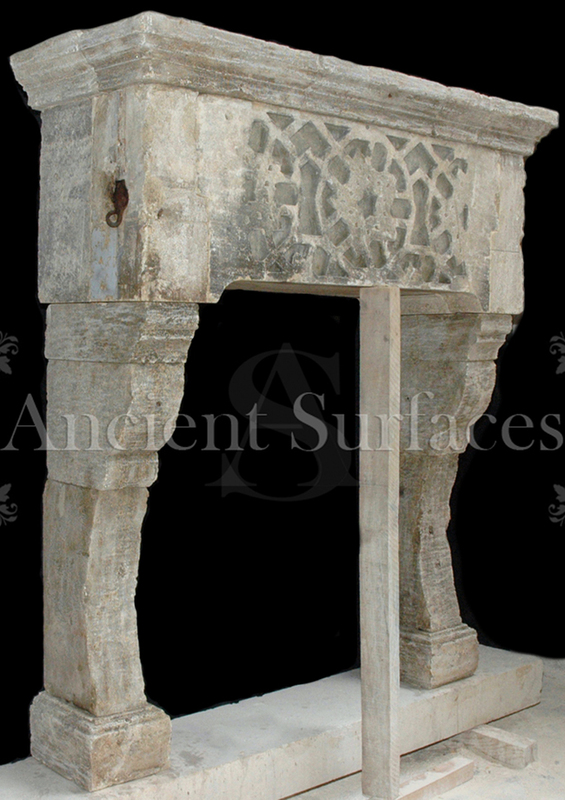 This simple limestone carved fireplace is Tuscan in design installed with a thick stone hearth ad terracotta bricks. 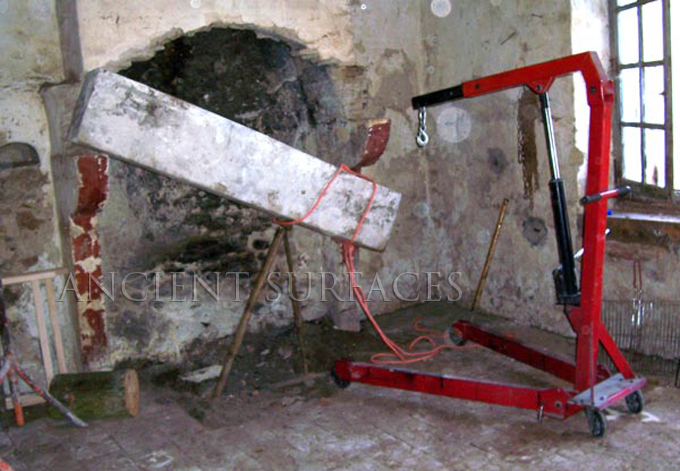 Running bond brick are inlay inside the firebox. 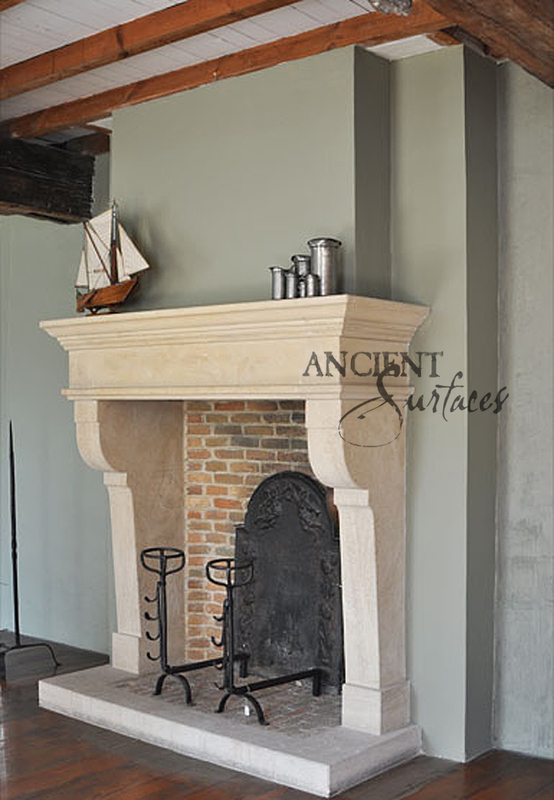 A simple French fireplace hand carved in natural stone installed with horizontal and vertical running bond firebox bricks. 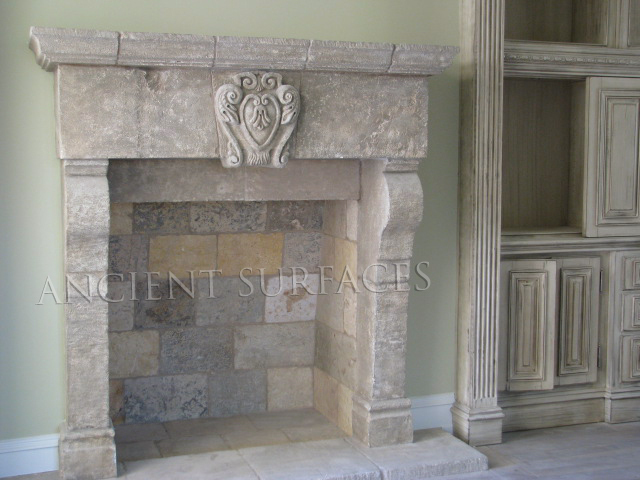 Another Italian inspired simple fireplace hand carved in natural stone installed with an inserted, benched, raised stone hearth. 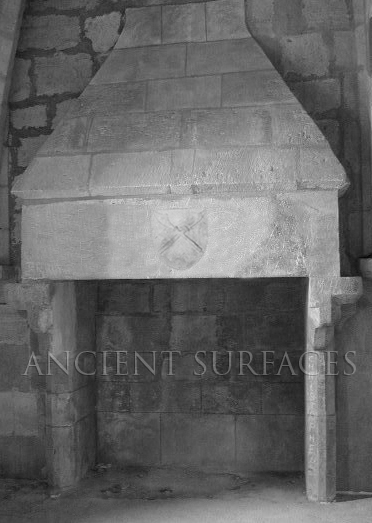 A simple Tudor fireplace hand carved in natural stone installed with herringbone bricks, lining the insides of this gas burning firebox. 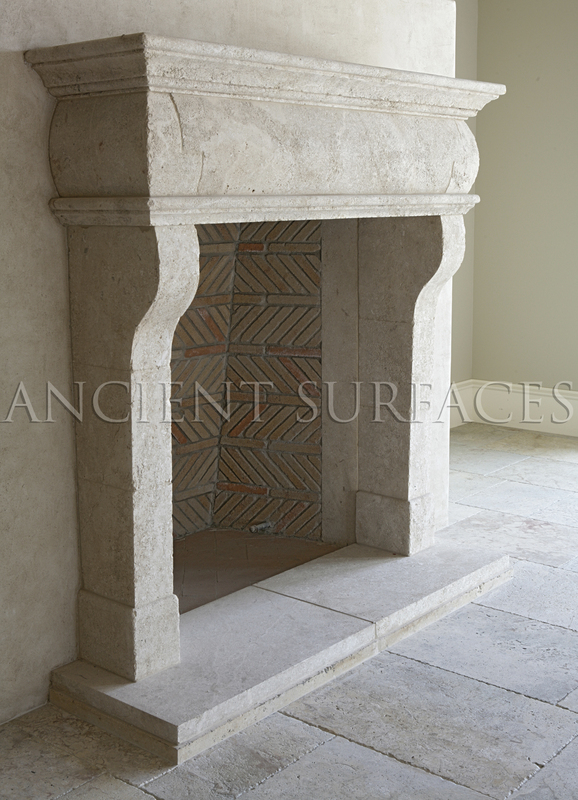 This Italian countryside fireplace was hand carved out of limestone & installed with an interesting crisscross herringbone pattern. 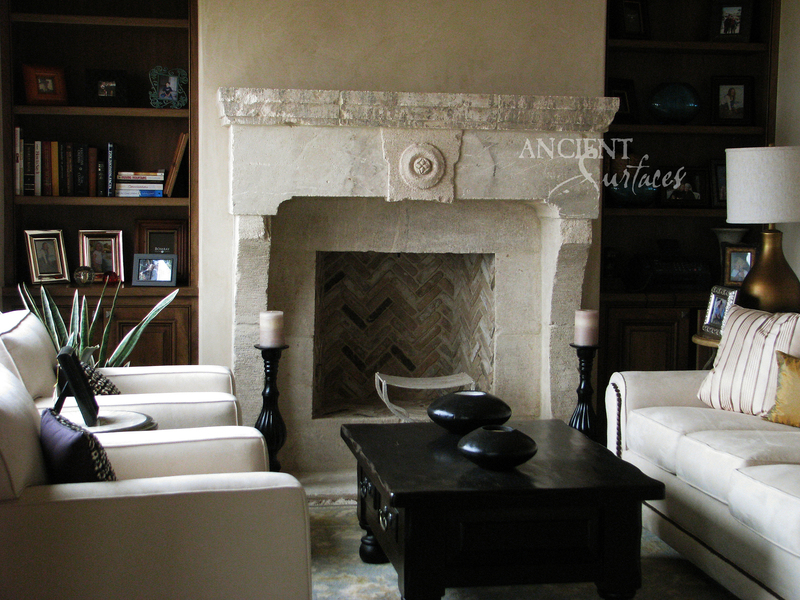 A unique hand carved limestone fireplace coupled with its own custom seating bench. 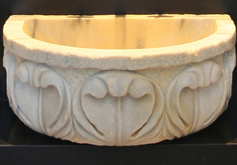 Ideal for outdoor settings, and family rooms. 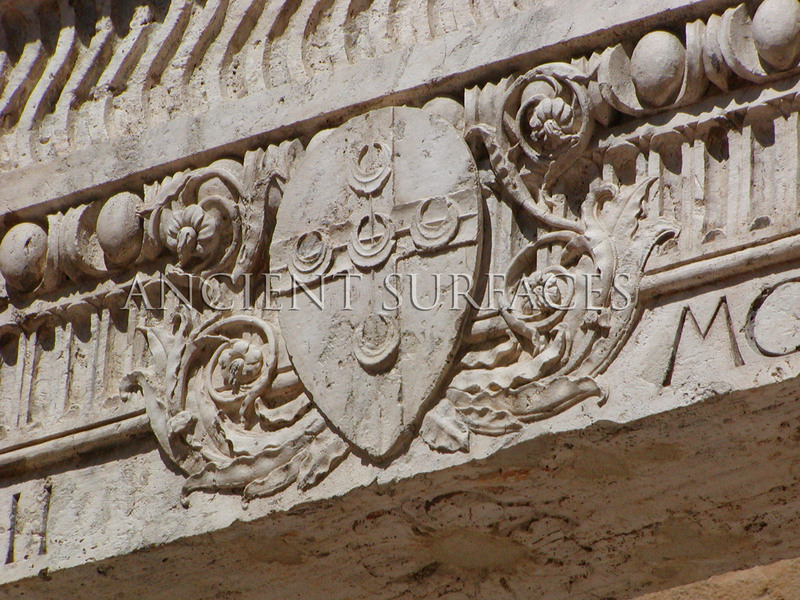 The middle Floral is an old European symbol of the Virgin Mary, is carved and mounted on a the middle keystone. 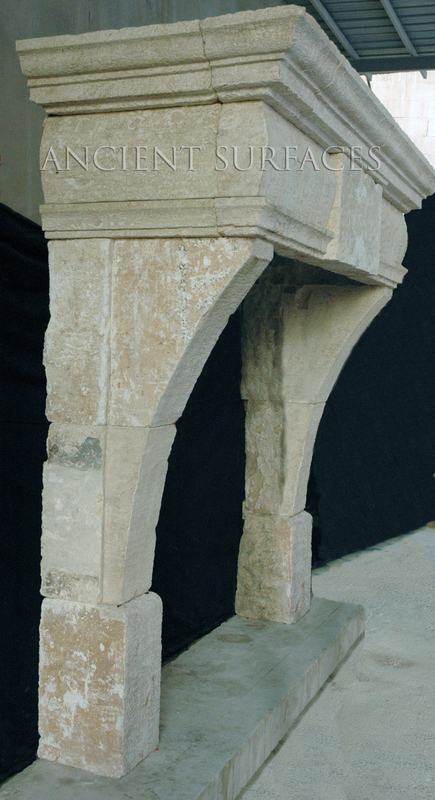 Side profile of the same hand carved limestone fireplace shown just above. 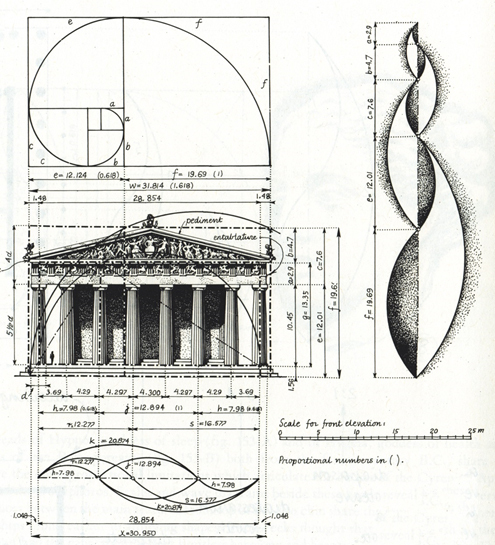 We still consider ourselves apprentices who are in constantly pursuit of perfecting our craft by learning more and more about our past and how to better merge it with our present contemporary setting because once you stop learning about your roots and origins you stop caring about your future projection and stop growing as a company or as individuals. 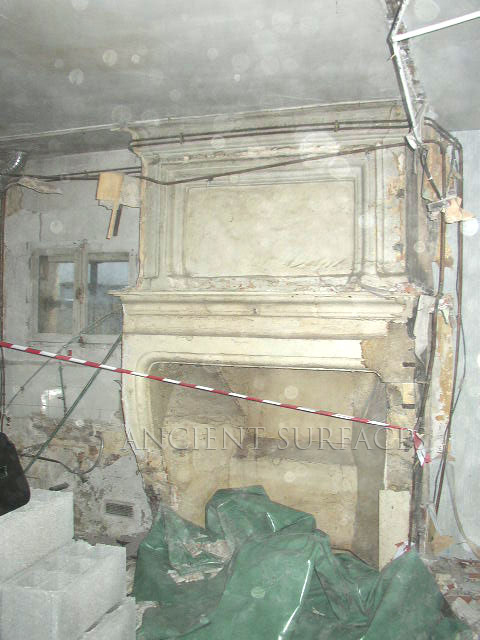 Our deep knowledge and experience in hand carving, sourcing and installing antique limestone fireplaces isn’t restricted to European style fireplaces. 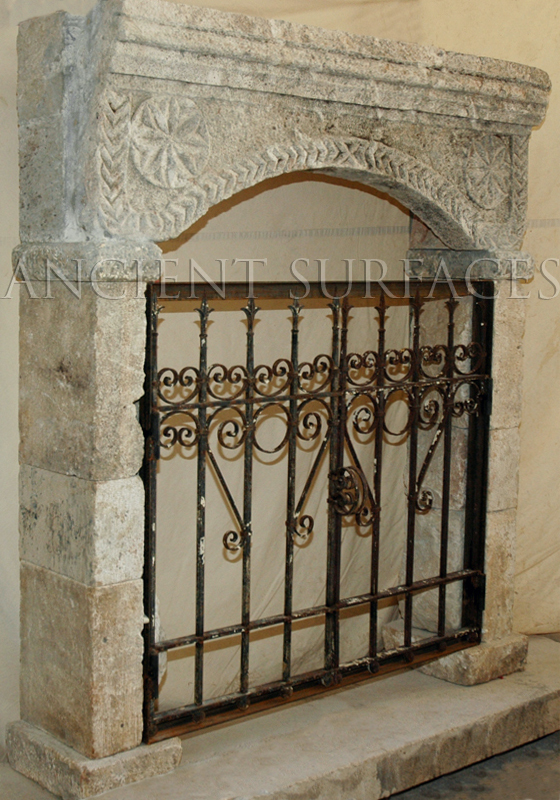 Gothic Tudor style fireplaces that contain very little to no decorative carvings are perfect candidates for any Asiatic, Feng Shui Style home. 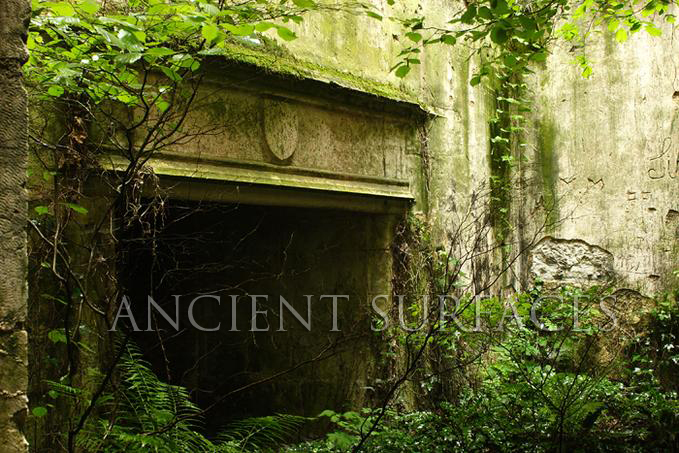 We do get asked a good question that we feel the need to address: Why not restore the structures and preserve this history within them for generations to come? 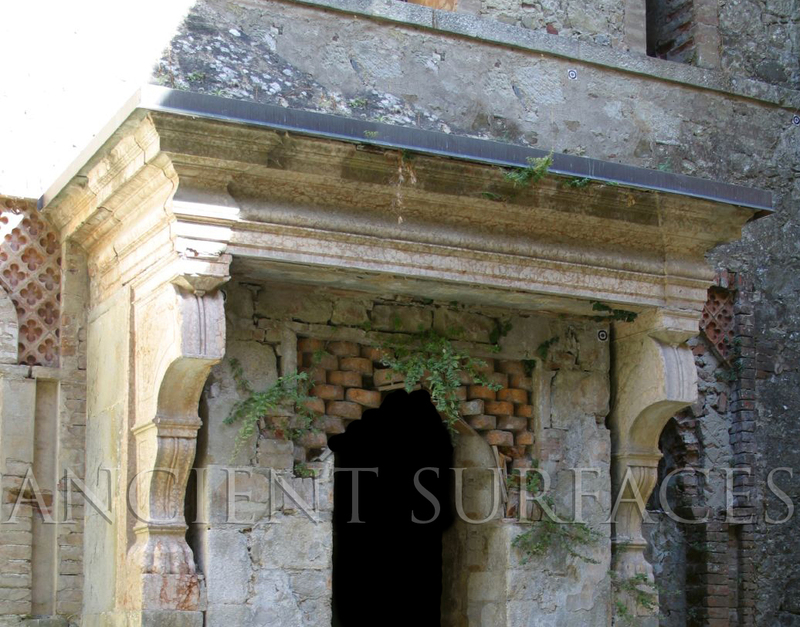 And the simple answer to that question is that its impossible to restore every single structure ever built until the last century! 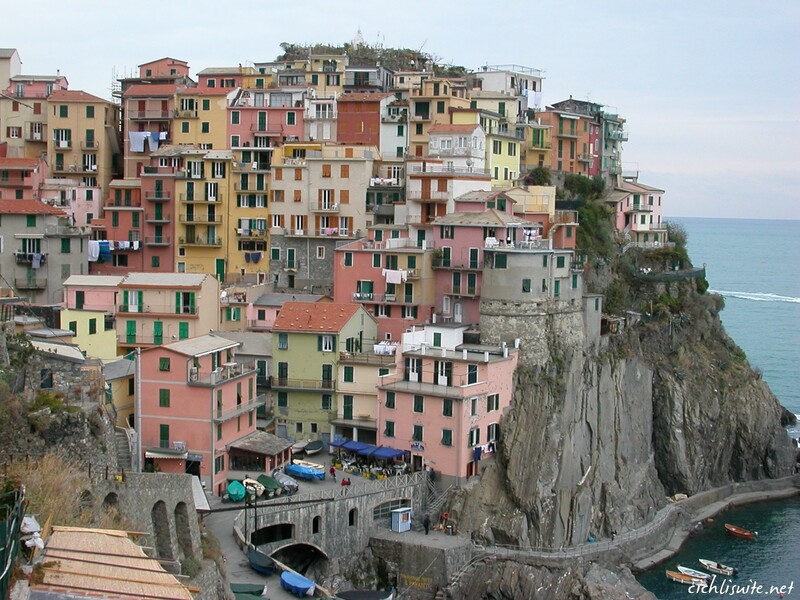 Cinque Terre May 26th 2011- A new meaning for people living on top of each other. Both private and public owners around the world are constantly facing that same dilemma, to make the tough choice between what to restore and what not. 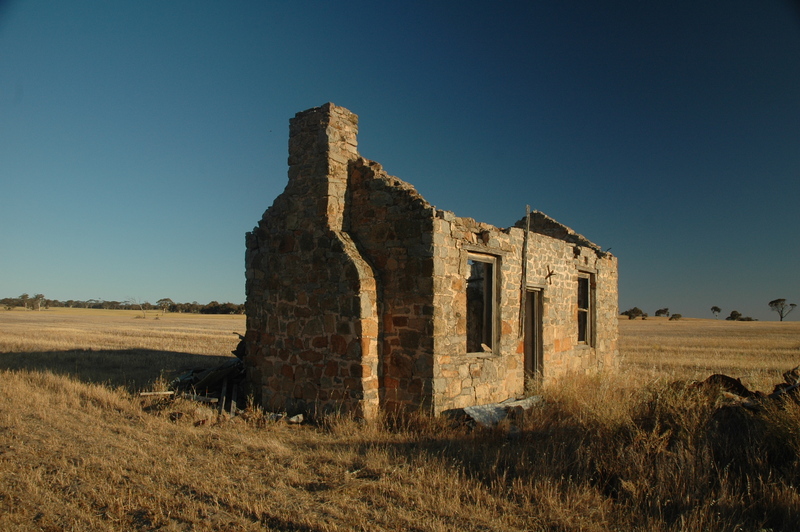 As demand for the existing land slowly overtakes the preservation needs of earlier structures, (built-in the last few hundred years) the unfortunate choice becomes more obvious as a triage approach becomes necessary. 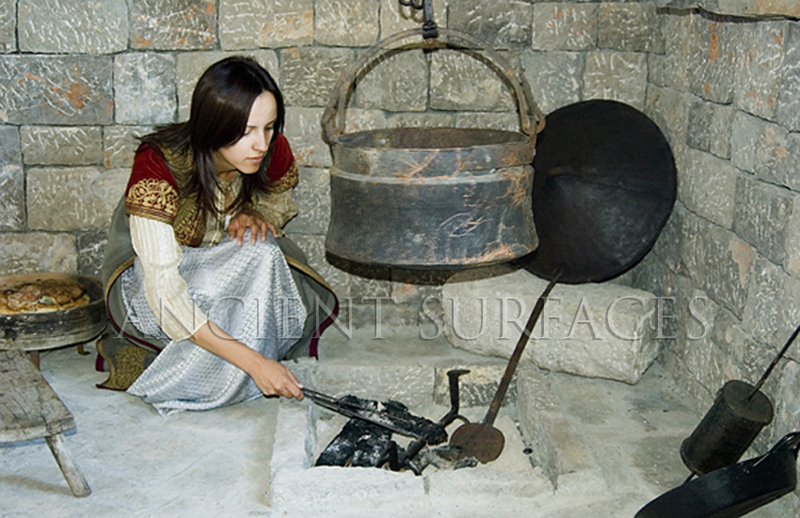 The bright side to this story is that nothing gets wasted nowadays. 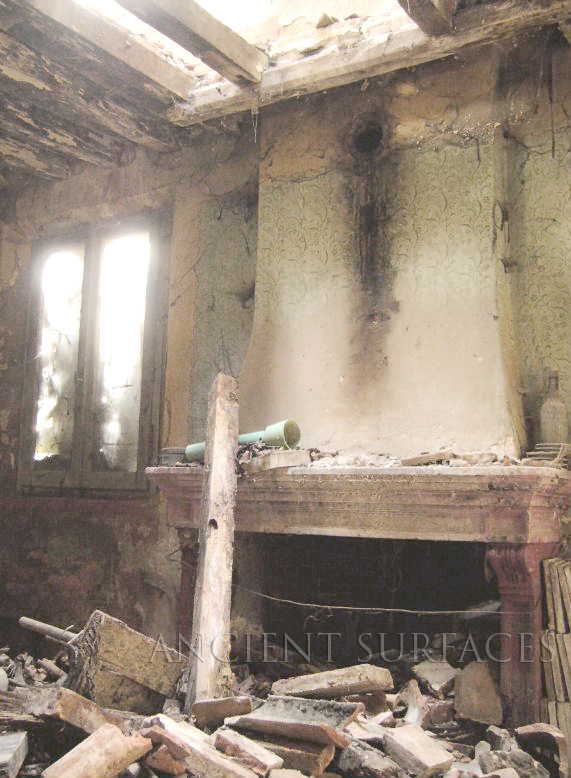 The image of a wrecking ball destroying great-grandpa’s cottage is a thing of the past. 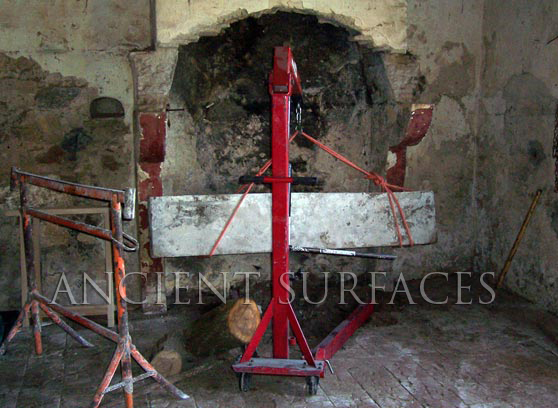 Thanks to the public awareness of multiple millions of professional and armature reclaimers alike, more people from around the world have developed a passion in reusing and restoring every single old fragment that gets demolished: from this old nails to that old wallpaper! 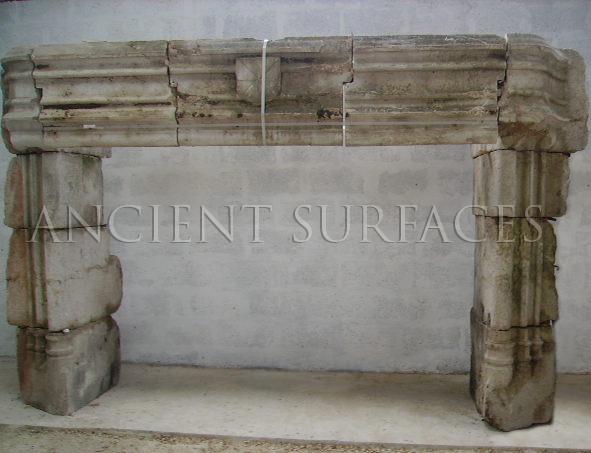 There are interesting stories to each reclaimed mantle because they usually capture the essence of the ancient structures they once came from. 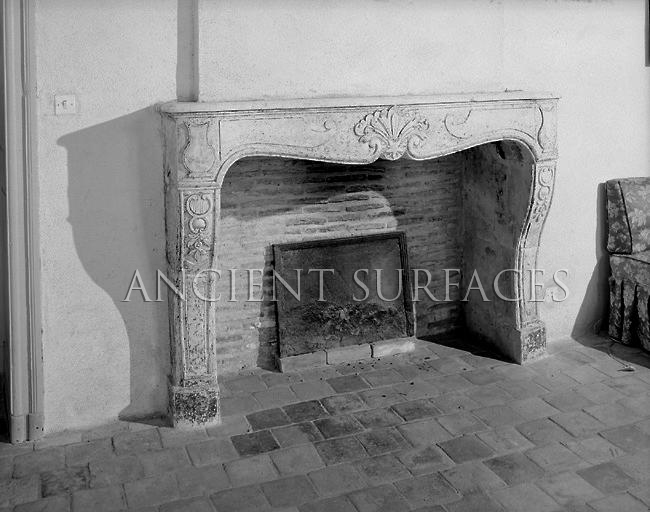 Antique fireplace mantle in a french villa in Avignon Circa 1610 A.D. 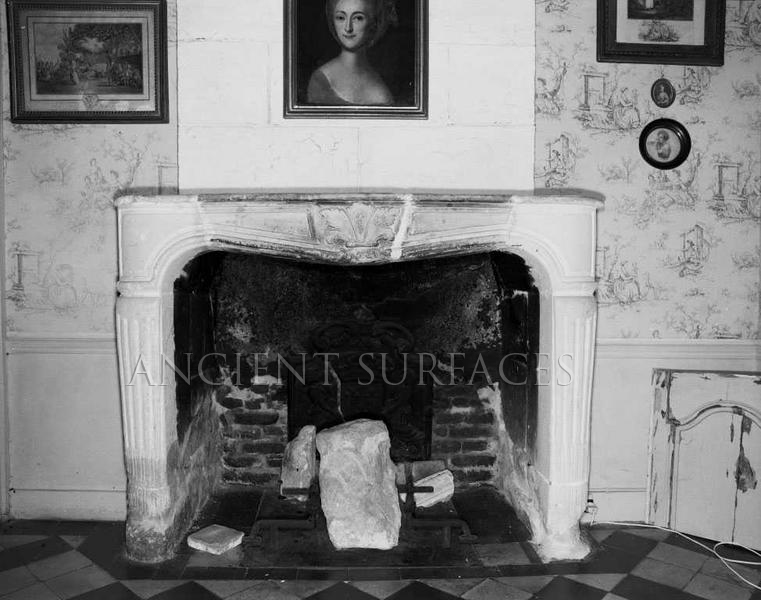 Even when the fireplace origins are unknown it could still shed a bit of light about its lineage. 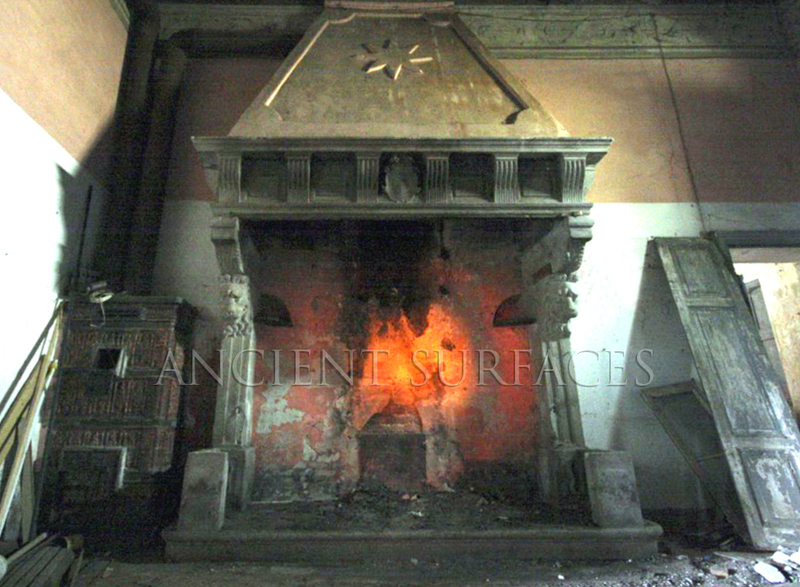 By knowing what to look for and paying attention to every minute detail within the mantles one can start understanding the hidden markers. 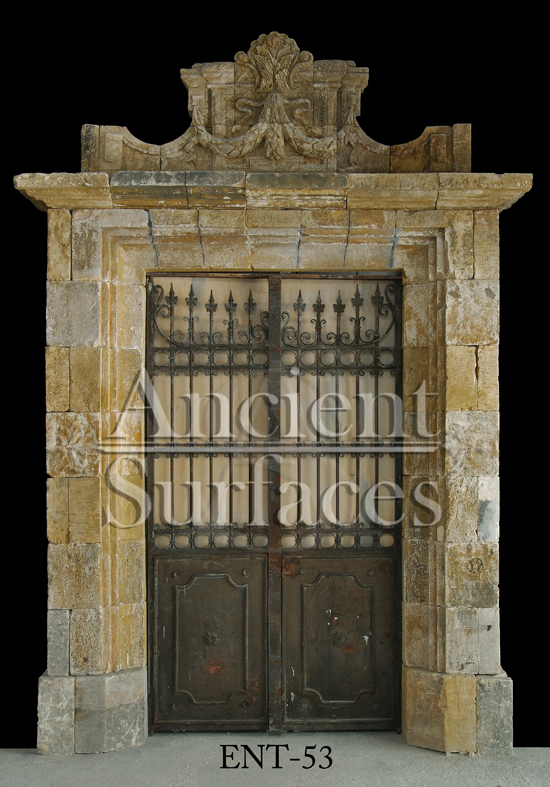 Just like in humans were the eyes could be the window to the soul, as they say, the mantle midsection could carry a ton of information on who the mantle owners were and what they held dear to their harts. 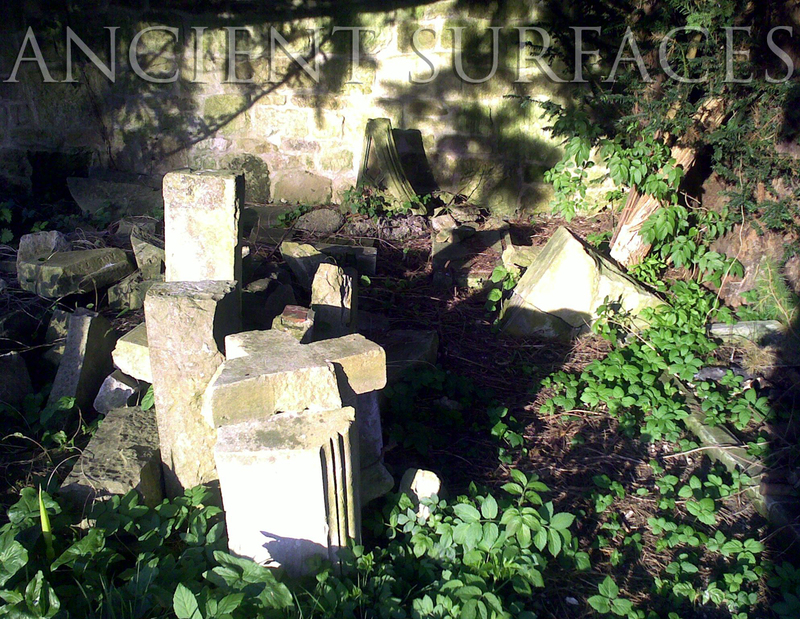 From a scribbled date or a capitalized initials, to a carved cote-of-arms or an angle cut of a keystone may be found and maybe indicative to the origins of each piece. 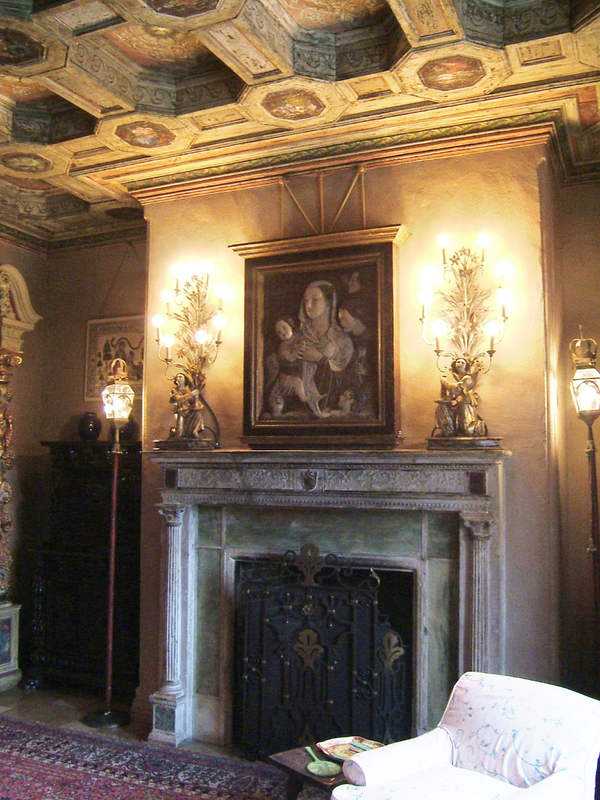 The general rule of thumb is that the more unique and individual an antique mantle was, the more pivotal the villa or mansion it must have been in. 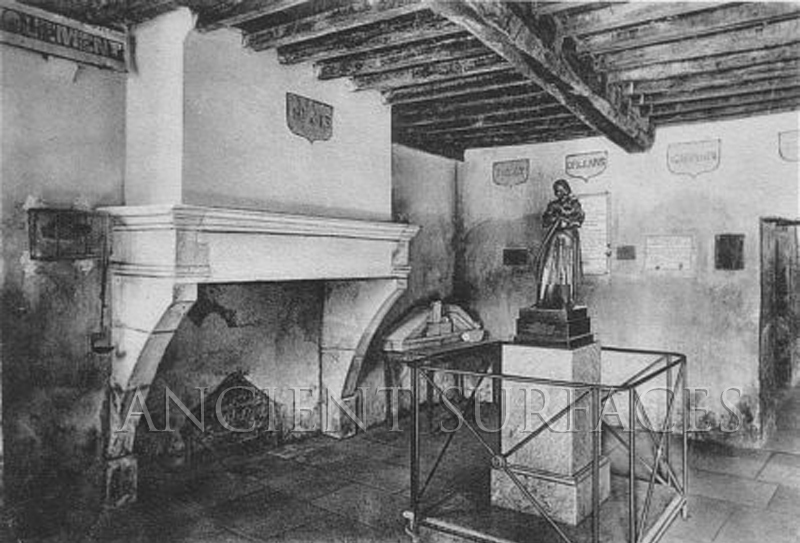 Notably, as time went on, the stone fireplace mantle became a defining marker of nobility and a Status symbols in all European countries and kingdoms with no exception. 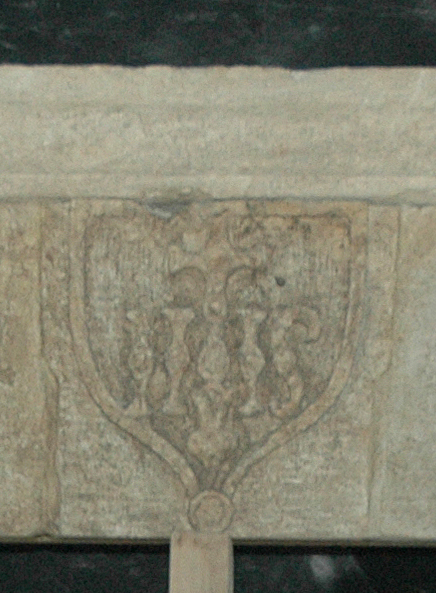 It became so much so ‘the’ status symbol that it was were many European families chose to carve their Heraldic arms and last names on, which in itself was the most important socioeconomic marker of the 13th century and still is in some ways.